Back again with the second of the two Layering Stencils that were released last week, Holly Bough. For some reason I just kept thinking glitter. Stickles Dry Glitter in Platinum to be exact. My favorite color of all! We use this glitter in the Gilded Christmas Box class and it sells out at every single store! The color is just the right mix of gold and silver. Perfect for Christmas in my book! Once the Embossing Paste was dry, I used the Sizzix Alterations Mini Baroque Die and my Vagabond machine to cut out this great shape. Perfect for a gift tag! I suppose I could have cut the shape and then added the glitter but this way gave me a clean cut edge where the glitter runs over the edge of the tag. I came up with a few additional embellishments. Stamp the back with a nice Christmas sentiment using the Deco Christmas stamp set. That fits quite nicely! If you don't have the stamp set, then how about a Vial Label? It is my go to embellishment! Just add a couple words from Seasonal Chit Chat. Or how about a simple WISH ticket? Easy enough. Well I hope one of these ideas spurs some ideas for using the Holly Bough Stencil. I am already working on something else for later in the month. As I said before, I have two to give away...just leave me a comment and I will pick a winner on Monday morning. Oh, and by the way, my friend Richele is also giving away stencils, so hop on over to her blog and see what she's been up to...it's a winter wonderland! I love the glitter idea, such pretty tags. I would love to win, thanks so much for the chance. Gourgeous tag! Love the stencils and the glittercolor! That glitter looks wonderful, I can see why it sells out! my gosh, these are beautiful! I love platinum in both the glitter and stickles. it is my fave shade next to pink. ;) it's gorgeous with the holly stencil. thanks for the inspiration! Great use of glitter. I don't have that kind, but I think you've talked me into it! I love that tag! Those stencils are fabulous! Love this stencil and also the platinum glitter - my favorite color of glitter. Your tag turned out beautifully! Thanks for the chance to win. Wonderful idea to use for the coming season! Stunning and you are right the PERFECT vintage shade of silver! I never would have thought to use texture paste through a stencil to ADD GLITTER.... I have the glitter and the texture paste - now I need that stencil!!! I love your playing with the stencils...so many ways to use them is inspiring - thanx! Love that glittered holly, gorgeous! Thanks for the chance to win! Your tag is beautiful! I love the way you added the glitter to the embossing paste, and the color is gorgeous. Thanks for the inspiration! I have just started to work with stencils, and am loving the holly! Well, lets be honest, every one of Tim's new stencils are on my Christmas wish list!! Thanks for the chance to win one! very glittery! i still have some of the glitter from the Junk Drawer advent calendar, might have to make do with that one and a different stencil... hmm.... thanks for the ideas! Love the holiday stencil. Thanks for the opportunity to win this decorative stencil. Fabulous! 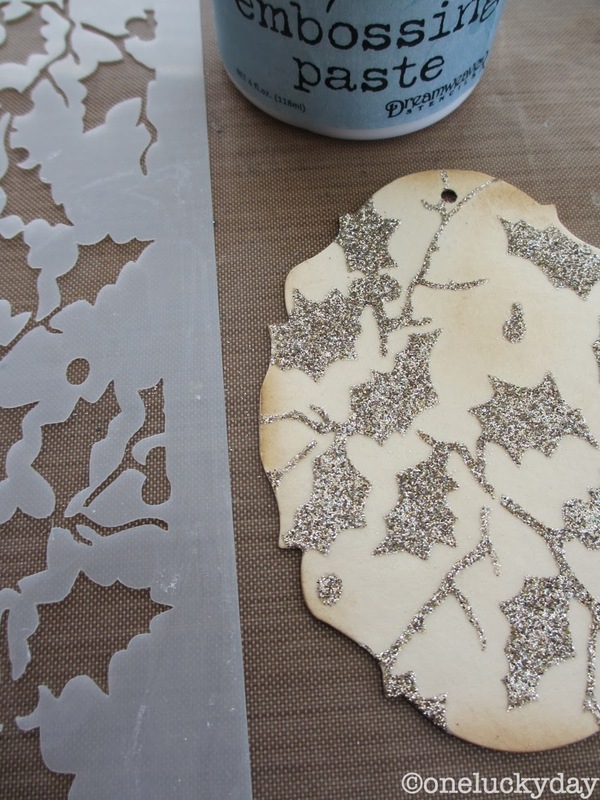 I love the holly design, and it's a great idea to use the glitter over the embossing paste! Didn't realize it would stick! Wow! Love the sparkle! I love the glittery holly. So beautiful. Thanks for the chance to win! I love glitter which is why I love your projects and ideas. I love how crisp the glittered image is - love that technique - 2 items added to my wish list! I've wanted to try the paste with glitter, now I am not so intimidated. Thanks for sharing. my name is Holly- would love to win the stencil!!! LUV this stencil!! your tag's stunning; thanks for a chance to win & I know everyone wants to, especially ME!! I like the Holly Bough stencil even better than the last one! I love how you created the tag with the glitter, very vintage Christmas, and also how you gave us option of how to embellish depending on what we have on hand. Thanks for the chance to win the stencil and for telling us about your friend's giveaway as well. Wow, love this stencil ... and the fabulous tag you created! What a terrific addition to anyone's holiday craft supplies! Thanks for the chance to win! I am in love with Tim's new stencils I just bought the shatter stencil but I keep eying the harlequin I really love what you did with it making the ice skating card and using the glitter on the holly gives me many ideas :) Beautiful cards.. Thanks for the chance to win. I just love stencils they are so versatile, it would be fantastic to win these. How cool its a simple and clean cut tag just love it. Its simply beautiful. I am in LOVE with this stencil. Can't wait to get my hands one and start playing! Love the new stencils and the glitter is really cool. Tag is great too! Love your ideas ... The tag is awesome, so beautiful! Wish me luck with the drawing of the stencil. Wow, how stunningly beautiful. Wish me luck also! Your tag is beautiful♥ Thanks for showing us how to do it! Now I need the stencil! Both those stencils would be stunning in glitter! You've inspired me to go look at all my stencils with that in mind. Thanks. 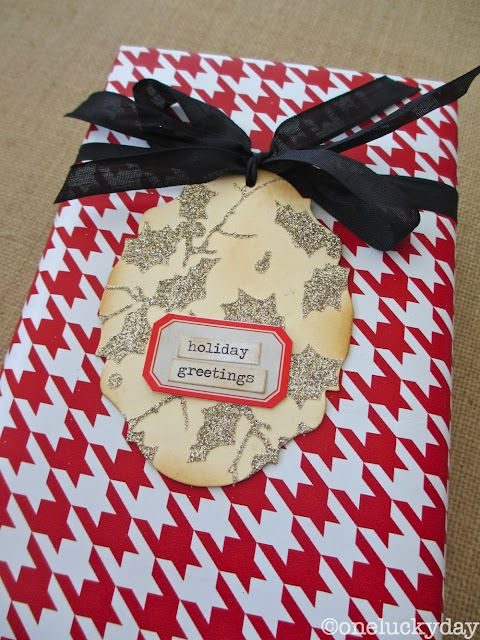 Deck the halls with a Holly Bough layering stencil ! :) I just love Christmas !! Your tag is so lovely and yet simple. Thank you for sharing your ideas! Oh wow, that color of glitter done in the holly, looks fantastic. Thanks. So beautiful in a simple way. I love your ideas! And this glitter is fabulous! Oh boy new stencils and they are so versetile! Would love to let my inspiration go wild with these two! BTW your glitter tag is fab. Gorgeous, Paula! Love the new stencils and the glitter. Thanks too for the great tip on glittering before cutting. So simple but makes perfect sense! Love that glitter! If you pick my name, please Pay It Forward and pick another since I own this one too. Thanks to my friend Donna Gibson! Oh my!!! That tag is GORGEOUS!!!!! Your gift wrapping is ALWAYS so elegant! And what a coincidence, I was making gift tags this week using Tim's Tag dies and the reindeer die (Love that one). Didn't use the glitter this time, the deer were cut using cinnamon colored velvet paper that I embossed. Came out really cool! Thanks for the inspiration and the chance to win! oh, I just love the dimension on the holly and glitter, so cute. the hounds tooth is one of my favs. A thing of beauty! I really like the dimension the embossing paste gives. What a great design, especially since I LOVE glitter. Thanks for sharing. Always something to spark ideas! Thanks for the giveaway, too! 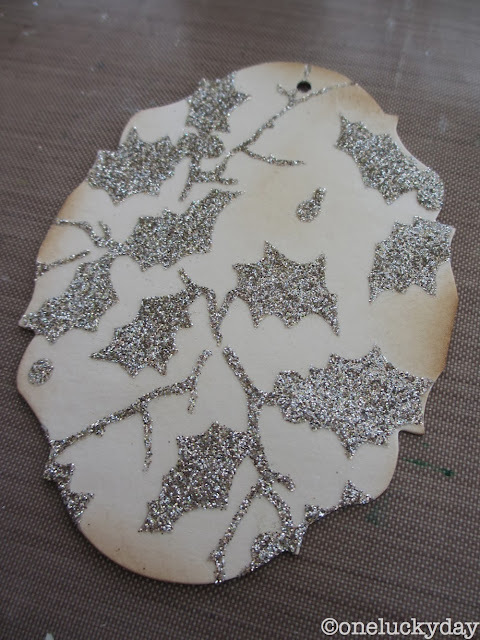 Love the holly branch stencil and the antique look glitter is a fabulous way to use it! I love the Platinum Glitter. It is so elegant and vintage. I tried to buy the harlequin one yesterday and all the stencils were sold out. So thanks for the chance. Great ideas, the stamp from the Deco set really fits the tag nicely. Love the platinum glitter on the front! I've painted with stencils. I've inked with stencils. I've gessoed with stencils. I've embossed with stencils. Why have I never thought to glitter with them?! Genius. Love this simple yet stunning tag with the holly bough stencil..BEAUTIFUL! Thanks for the chance to win! Beautiful tag It has been awhile since I have used embossing paste, I am going to have to get mine out. I recently purchased Wendy's stamps and her embossing paste is on top of my want list. Love that glittered Tag! It's gorgeous. Thanks Paula for your beautiful ideas and such a fun giveaway. Tim's Stencils are definitely on my list, as well. Ohhhhhhhhhh - I'm going to my playground right now to try this with Wendy's paste and Tim's glitter. Thanks! I love the glitter idea - perfect!! Absolutely beautiful stencils - and your work!!! very nice effect with the glittered stencil and then die cutting. Certainly adds something special to a tag. Thanks for the inspiration...and chance to win! How beautiful! Both the stencils and tags!! Love the technique to add the glitter and the tag turned out great with so many ideas for its usage. Thanks for the inspiration. love this technique, its so nice on this stencil. Thanks for the inspiration. I was wondering if sprinkling the dry distress glitter on top of the translucent embossing paste results in the glitter remaining in place when the tags are handled? Lovely project, and thanks for sharing this idea with your fans. Linda, That is a great question. Once I had the embossing paste/glitter on the card, I let it sit on my desk for a good 24-48 hours to make sure it was completely dry. Some glitter did come off when I ran it through the Vagabond machine but now on the package it is very, very little. You have to tap it or rub over it to get even get a small amount off. I am very happy with the embossing paste/glitter result. The key is just walking away and leaving it to dry. I love the Holly Bough stencil & that glitter is fabulous! Gorgeous tag! 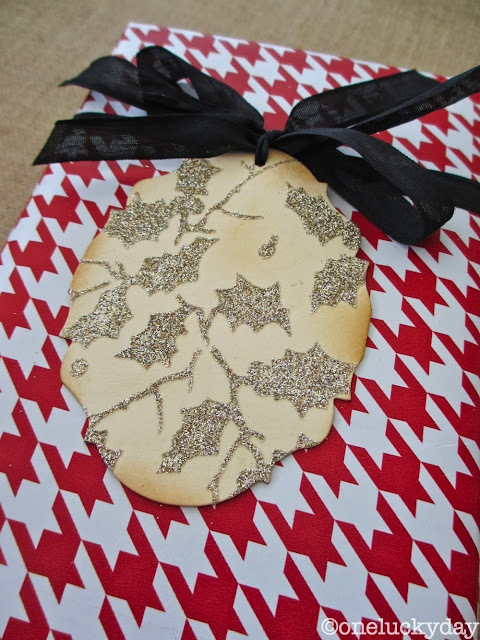 I love that glittery tag using that holly stencil! Perfectly festive and beautiful! Just loving this idea for a simple but elegant gift tag. Thanks for that comment to Linda re the glitter rubbing off the paste....I wondered how your thin die cuts handled the glitter, but then I guess the label is one of the thick Sizzix dies. Delightfully simple idea. I love the Tim Holtz line and would like a chance to win one of these stencils. I enjoy reading your blog and seeing what you come up with. I love the idea of using the stencil with glitter, awesome! Thanks for sharing, the tag is lovely. I love this stencil, and would love to win one. Thank you for the chance to do so! this is beautiful- thanks for the chance to win! What a gorgeous tag, and I love the stencils!! Love all that glittery goodness! Such a classy card! Thanks for the chance to win. This is brilliant - in more ways than one! Love the stencil and that beautiful glitter! Thank you so much for this chance to win Paula - I love the glittery holly look. I wonder when the stencils will hit the UK. I'd be worried about getting glitter in my Vagabond! Way to be fearless and making it amazing! Hi Paula, unrelated question, will you be doing new pdf. calendar pages for 2014? Thanks! So sorry, I must be losing it, I remembered as soon as I looked at the link. Static is to blame, I swear. Wow....I love this lil stencil and the effect on label and card is soooo special. Got to find this stencil....no one seems to have it in stock. :( Love how you used this adorable stencil ....Thanks for sharing! Gorgeous tag! Off to find that TH stencil! Great idea with the stencil & embossing paste! Love The Use Of This Stencil with the Embossing Paste. Thanks For Sharing. Another great use for the stencils - glitter!! Well, now, that's just cool! I love the holly, especially. There are so many ways one can use - hey, Happy Thanksgiving! - stencils. Thanks for all you do to inspire so many of us! Thanks so much for taking the time to share all these ideas during this busy time.